When I left school and began working with period furniture in a restoration workshop, I think I was as much in awe of my mentors' ability to place items chronologically as I was their talent for hand veneering or making cracks disappear like magic with a fine polishing mop. I could spot a set of Road Rider 4s on California Slalom trucks from across the street but the difference between a Victorian monstrosity of a sideboard and a sleek Georgian example was, for a long time, a mystery to me. But hang around anyone in the know long enough and their knowledge and experience will find a way into your subconscious. 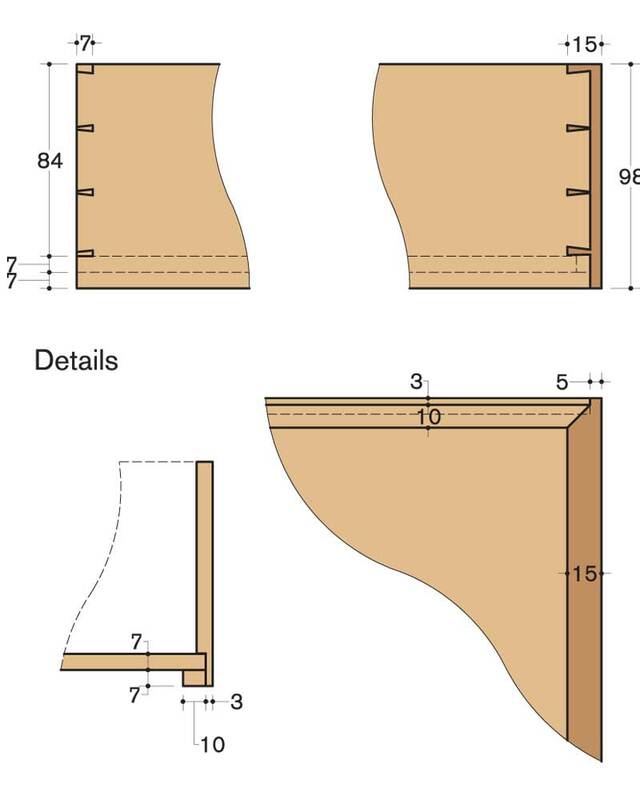 I like to acquire random bits of information relating to the construction of furniture, and always enjoy looking in the darker recesses for clues left behind by the craftsman that might tell me something about them that is not obvious from the outside. Our deconstruct this month is partly an investigation as to whom this lady's writing desk might be attributed and what we might learn from their endeavours. On display at Chiswick House, the subject of our feature on page 24, it's estimated to be from the latter part of the 18th-century and features discreet inlay to the lid and legs on all sides. The veneer on the top section is a mahogany of sorts with a figuring reminiscent of what is sometimes called 'fiddle back' but could equally be described as rippled. It's interesting in many ways and serves as a record not least for the techniques used in its construction. I'm not suggesting for a moment that you adopt these methods for the drawer I'm about to make, but rather enjoy the experience of recreating something reasonably authentic from the past, complete with faults. There's a different kind of logic to reverse engineering a component like a drawer, and in this process, I'm fortunate that I didn't have to observe any critical overall dimensions such as a finished carcass with drawer apertures. I started, therefore, by preparing the baseboard from Douglas fir (Pseudotsuga menziesii), using a shooting board and well-tuned bench plane - traditional methods, roughly speaking. 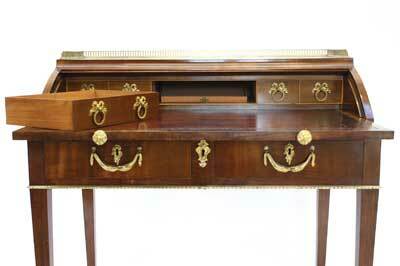 The original drawer is made entirely from mahogany. 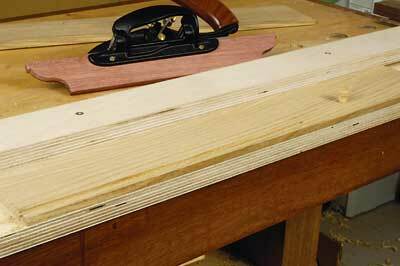 A quick and easy means of jointing thin boards is to take advantage of the elasticity in a good masking tape. Lay the boards in order and stretch tape across the joints as tight as you can manage, then repeat with tape along the joints on one side. 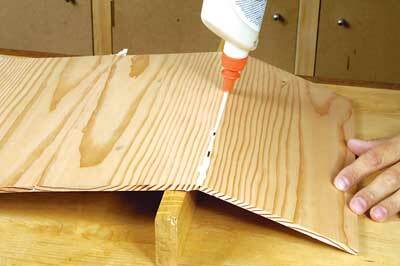 Flip the boards over carefully and allow the joints to open just enough to apply a little glue. 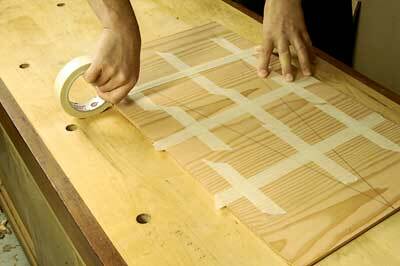 Using some waxed battens, clamp the boards flat and the tape will pull everything together nicely. 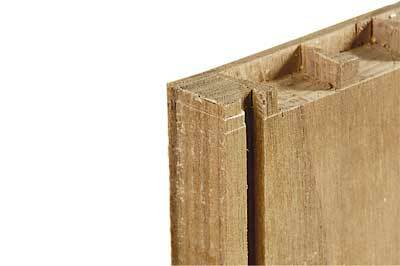 It's often said that scrapers don't work on softwood. They do. 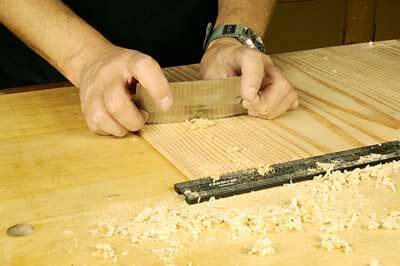 You just have to turn the burr slightly further than you would normally and use it at a much shallower angle. If you've got it right, the result will be some fine ribbon-like shavings, but be extra careful to make sure you hit the surface moving or you'll end up with some nasty dents. If there's a recurring theme in this deconstruct it's being as efficient as possible with marking, cutting and general processing. With components that have a common dimension, it makes sense to work them simultaneously. 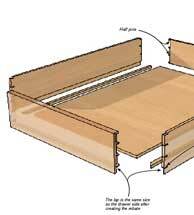 The front and sides of our drawer are of equal depth, so they can be planed at the same time. 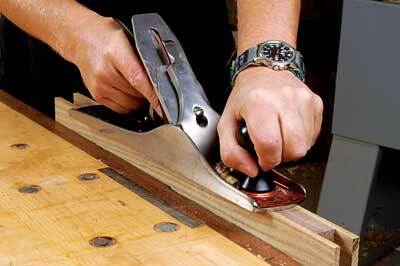 The added benefit of doing this is that thin stock of any length is tricky to plane on edge in a vice. Held in a bundle, the job is completed in a couple of passes. Similarly, the front and back have a common dimension and this is best duplicated by using one - the back in this case - to mark the other. The fence on your shooter is a convenient flat edge from which to work. Charles Mak demonstrated some basic techniques for using the plough plane in F&C 207 but I'd like to expand this a little and show how the plough can be used to start off a rebate if you don't have a large rebate or shoulder plane. In fact, the plough is probably the most underrated of all the speciality planes. Once mastered, it opens up a whole new way of working and, believe me, it'll get you one step closer to ditching your router. 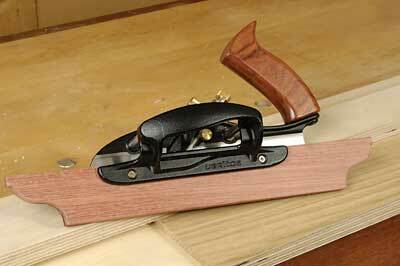 The first thing you will need for a new plough plane is an extended fence. It doesn't need to be fancy but a few minutes spent prettying things up is usually time well spent. It's not critical but it certainly helps if you can set the edge of the cutter in line with the outside edge of the ski. Not all clamping mechanisms allow this and there's likely to be some inconsistency between cutters in the same body, in which case you might need to balance tension from the lever cap and clamping pressure to compensate. 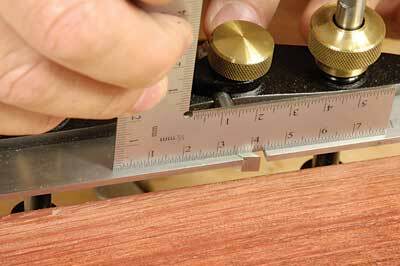 I never set my depth stop to the finished setting until the groove is well established. It's probably a little over-cautious but it will prevent you from going off course with the first, and most important, couple of passes. 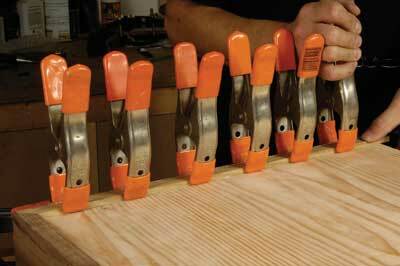 On thin stock like our 7mm drawer sides, mount the workpiece in a clamping jig with the edge flush with a thicker piece of supporting material below. Lift the back of the plane and take a few nosediving passes around 25° to the face of the board with as much, if not more, sideways pressure as forwards. 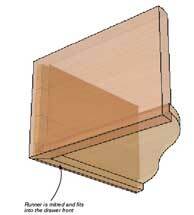 The reason for your fence attachment now hopefully becomes clear: a lot more contact and stability. 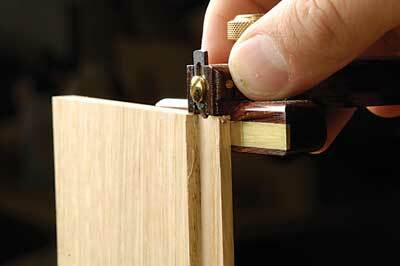 As the groove becomes established, lower the back of the plane and make the passes longer. Don't aim to complete a full pass until you are at least 50mm short of the back of the board. That way, if you veer off course, it's only by a short distance and you will have allowed for this when rough dimensioning your components! 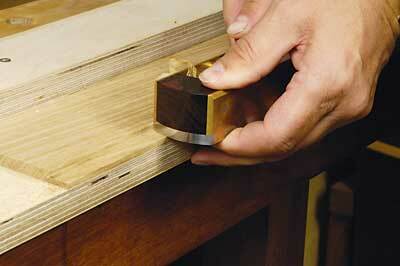 With the grooves completed, you can shoot to length using a little packer from the drawer base to support the groove. 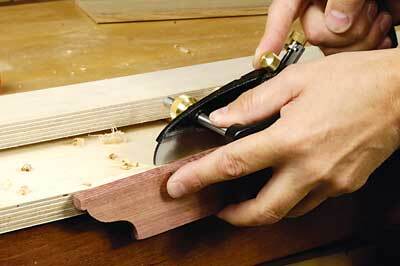 Using a block plane, you can now run off the clean wall of your groove to transform it into a perfect rebate. Using a gauge of some sort, capture the extent of the remaining material after the rebate has been established. I wouldn't get too hung up on the precise measurement: it's around 3mm if you're wondering but the crucial thing is to have both drawer sides identical. 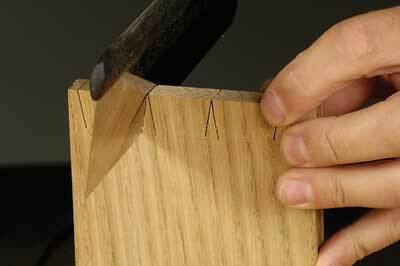 Transfer this mark to the ends of the drawer front to establish the lap and take what will now give you the baseline setting for the dovetails with a second gauge. 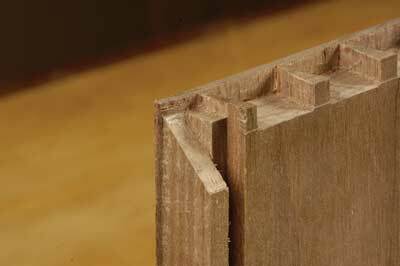 The number of photos in this sequence doesn't tell the full story behind cutting these fine dovetails. 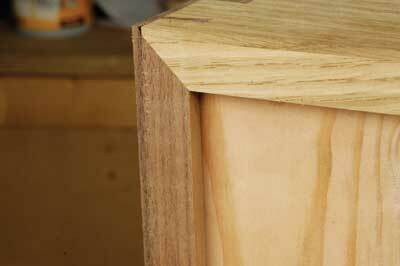 I've always known them as London pattern dovetails but I've also seen them referred to as single kerf dovetails, for obvious reasons. 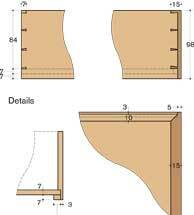 The angle for these is generally closer to a straight cut than would otherwise be used and there is no advantage in doing this other than for cosmetic appearances. In the spirit of the exercise, I cut mine freehand. No spacing out with dividers and no sliding bevel. I didn't get it right first time, or the second, or the third or fourth in fact, proving just how hard it is to break from your own style. It didn't help forgetting to create a half-pin at the edge of the rebate. 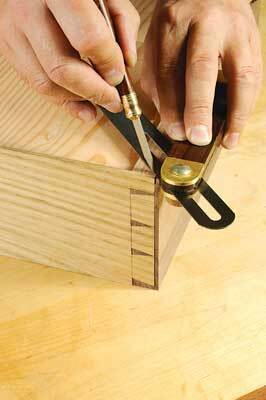 When this detail is transferred to the drawer front, take your first gauge setting and mark a shallower baseline. 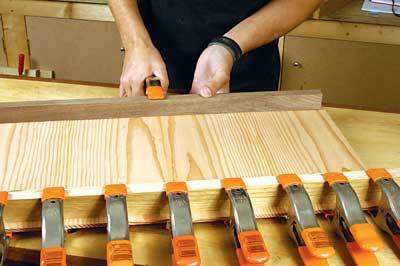 You may want to look away now if you're at all upset by the use of saw guides. 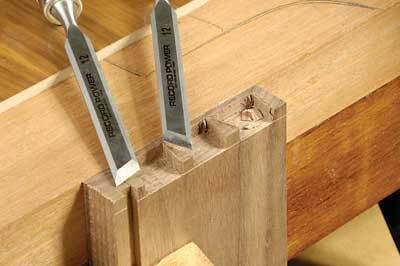 David Barron is now producing a range of dovetail guides in various angles, one of which is set at 1:8 and is perfect for London pattern dovetails. Of course, if I'd been following his blog, I'd have known this before I attempted to do it freehand. 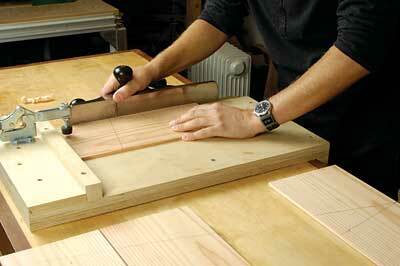 Another helpful hint for achieving this look is to invest in a pair of skew chisels. 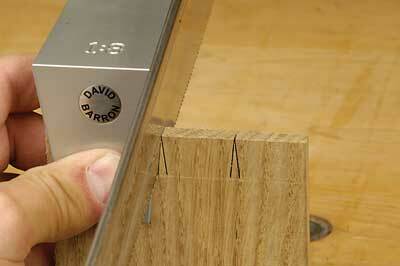 The tips of the pins are fragile and easily marred if you can't access the corners of the sockets easily. 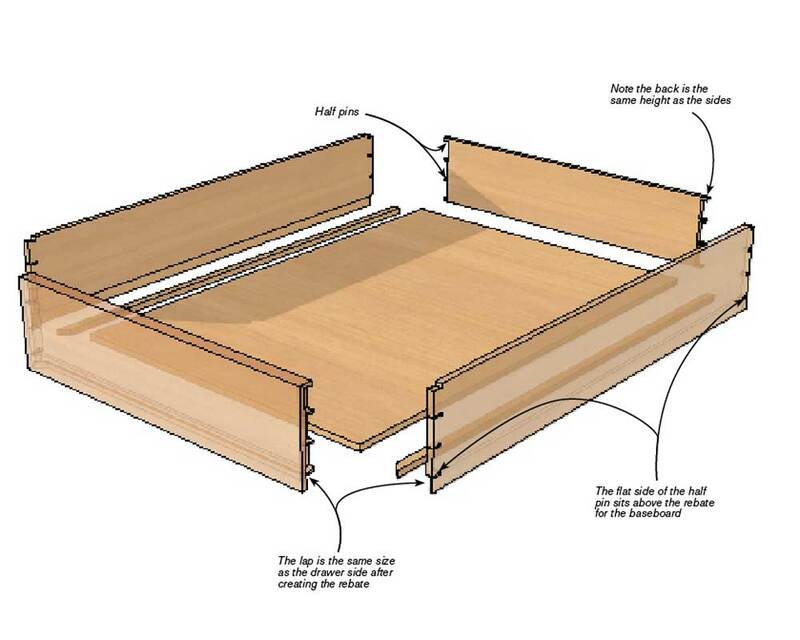 With the drawer assembled and face down, scribe a line at 45° from the corner where the drawer side meets the inside edge of the lap. 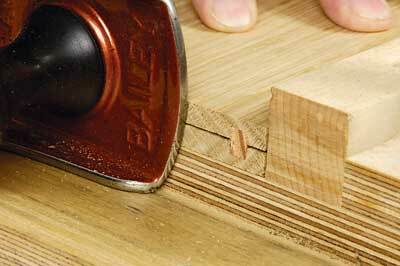 Cutting the waste away on the drawer front is a delicate operation and one immediately starts to question the merits of this construction on the grounds of efficient use of bench time. 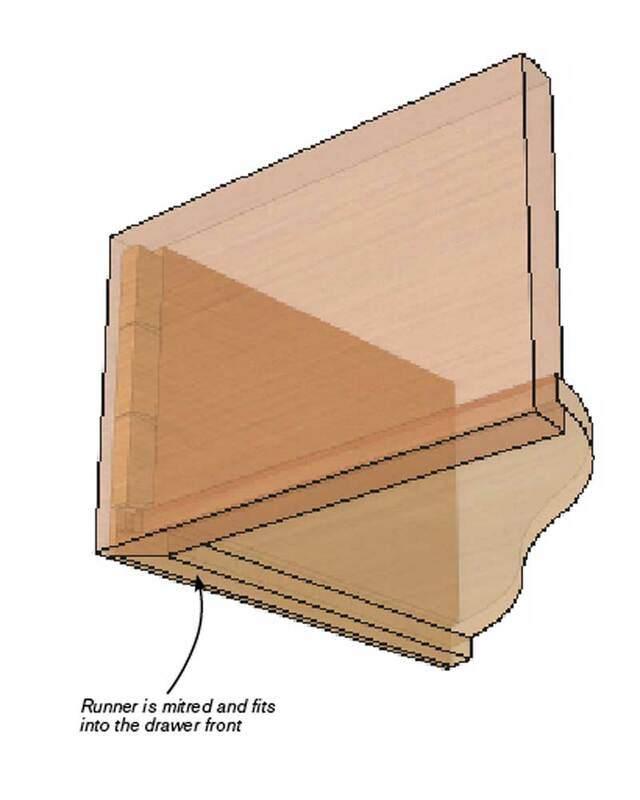 The final step is to add runners to the bottom of the drawer directly to the baseboard to a thickness that meets the depth of the drawer side. If you think this sounds a little irrational you'd be right, and is only surpassed by the historical practice of using cut pins to attach the baseboard to the back of the drawer box. If the splits in the baseboard of the original drawer are anything to go by, you'd be wise to give this a miss. For all its faults this drawer design is extremely neat and although I wouldn't say I've managed to walk a mile in the original maker's shoes, I can at least say I've tried them on in the workshop. I'm not sure what advantage there is to constructing a drawer like this in terms of its strength or propensity to withstand the rigours of everyday use let alone the seasonal changes. But what I do know is that we can learn a lot from the craftsmen and women of the past, especially their mistakes, which are more valuable than their successes. 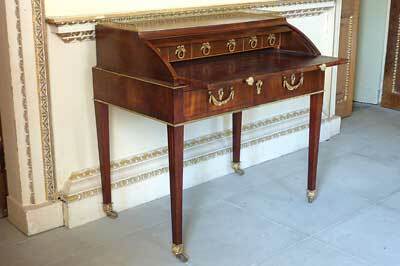 Although we have only looked at a single drawer construction for this writing desk, there are other interesting aspects to discuss. The secret compartment, for instance, that is hidden behind the middle drawer of the interior and, of course, the desk lid that rises as the writing surface is pulled and falls back shut as the surface is pushed closed. These two operations are at first puzzling for the user as they are counter-intuitive. 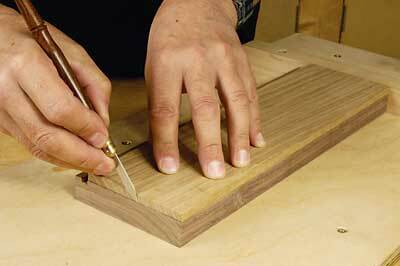 The means by which this sleight of hand occurs is the attachment of a tambour section to the back of the desk lid at one end and the back of the writing surface at the other. 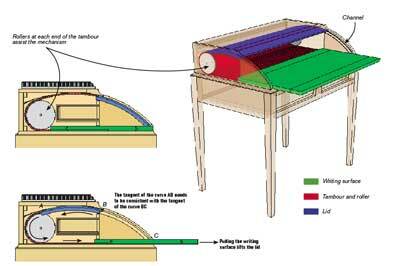 As the lid is a rigid structure, the channel in which it slides has to be a constant curve from a single centre. Many of you will be familiar with Marc Fish's 'L'Orchidee' desk that also features a tambour system albeit rather more sophisticated. The principle is the same although the execution is quite different, thanks to years of furniture-making evolution and the continued improvement in materials. "L'Orchidee is furniture design embracing the past and the future with an equal passion and enthusiasm."